Well I feel gyped. 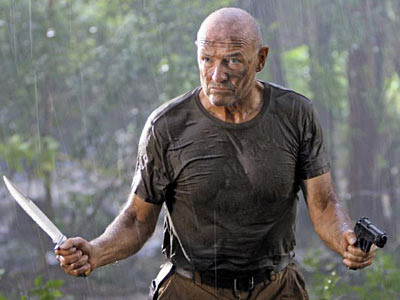 After years of being addicted to LOST and Horror movies- no one ever told me that John Locke was the Stepfather! How rude. It just so happens that I'm kind of glad I didn't know- or else my image of John Locke would be severly tarnished. 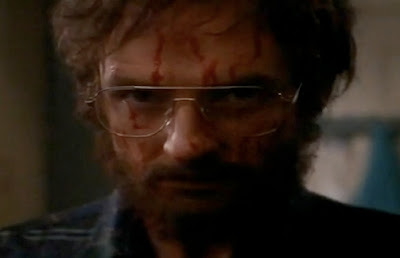 He's still just as magical and intelligent- only in The Stepfather, he's crazy and really kills people. But thankfully he cleans up nicely. Who else could go from this. No one except John Locke obviously. He is a magical Jesus wizard after all. OK where was I? Oh right The Stepfather actually surprised me quite a bit. I must say that the opening scene was fantastic. It completely set the mood and let you in on the very sick mind of our main character. Here is a man who has just brutually murdered his family. But he is calm and collected- absent mindly washing his hands of the blood, showering, and having a nice shave and a hair cut. A little change in outfit and hair piece- and he sets out of the house- while walking past the bloody bodies of his family on the way out. We then start to think- ok....so now we're going to find out how Terry O'Quinn meets his next family in which he will become the Stepfather to a smart and savvy teenager daughter. But wait no- he's already been her stepfather for at least a few months! Once I realized that very simple fact I was completely sold on the movie. Unfortunately the rest of the movie is a little slow moving- and at times kind of boring. We get one brutal head beating with a big piece of wood- but the discovery of the Stepfather's true identity wasn't as terrifying as I thought it would be. The introduction of Jim- the brother of Terry O'Quinn's previous wife- seems to do all the dirty work. It is him after all who discovers the truth, alerting the papers and getting Stephanie to start wondering. This would have been find and dandy if Jim didn't bite the dust so suddenly and disappointingly. Sure it is a bit tense when the Mom confronts him and he starts talking all crazy- but for the most part I found the best part of the movie to be in the beginning. 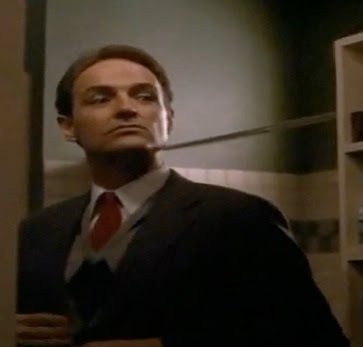 To be honest the only really great part about the Stepfather is Terry O'Quinn. The man is fantastic. He is pretty phenomenal at switching from psycho path to normal all American Dad- and with that beginning scene everything is just all the more scarier. That simple idea of thinking that you know someone, only to find that they have this whole other life that includes being a sociopathic murderer is frightening. In fact it's one of those movies that makes you question.....EVERYTHING. I still enjoyed the movie- and I do not intend on seeing the remake as I've heard that it's atrocious. If you really want to be creeped out read up on who the movie was loosely based on, John List. Now there is a creepy man. Still a pretty decent movie- although falls victim largely to slow plot lines. Watching the fall of Terry O'Quinns epic plan is pretty terrifying though- and seeing him try to make his next move on another woman is even more terrifying. Plus, what better way to celebrate the final season of LOST then with a blast from Terry O'Quinn's past. Oh John Locke I love you- even if you really are dead- and if currently you are possessed by a black smoke demon. Oh well! I've been dying for this movie to arrive in the mail from my netflix. It seems to have had a bit of revival recently. Anyway, great review! Got me really excited to finally see it. I absolutely love when he says the line "wait, who am I here". Andre, I love reading your posts as someone newly discovering all these movies. So refreshing like watching a toddler chase a butterfly for the first time! ...and if you want to see a creepy (TV) movie about John List, watch 1993's "Judgment Day: The John List Story" with Robert Blake... it takes on whole other levels in light of the murder of Blake's wife (for which he was tried but acquitted). 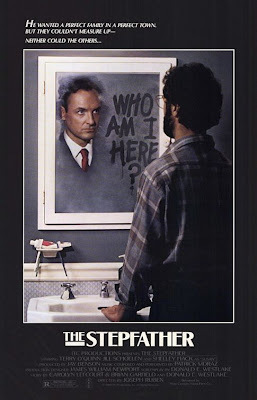 As for the Terry O'Quinn "Stepfather" - once again, a crack '80s production emphasizing characterization in lieu of a large budget... and the kind of movie they keep trying to remake (but fail to do a good job because they don't have the same quality screenwriters and performers). Umm isnt the daugher in that, Mary in BABES IN TOYLAND!!?!!!!! !